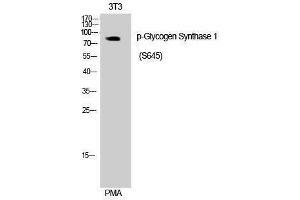 Specificity Phospho-Glycogen Synthase 1 (S645) Polyclonal Antibody detects endogenous levels of Glycogen Synthase 1 protein only when phosphorylated at S645. Characteristics Rabbit Polyclonal to Phospho-Glycogen Synthase 1 (S645). Purification The antibody was affinity-purified from rabbit antiserum by affinity-chromatography using epitope-specific immunogen. Immunogen Synthesized peptide derived from human Glycogen Synthase 1 around the phosphorylation site of S645. Buffer Liquid in PBS containing 50 % glycerol, 0.5 % BSA and 0.02 % sodium azide. Handling Advice Avoid repeated freeze/thaw cycles. Storage Comment Store at -20°C.